Key difference: The two liquids made from apples sound similar, but are different in their contents. An apple juice is a normal fruit juice, which is obtained by pressing the apples, whereas an apple cider is an unfiltered, unsweetened, non-alcoholic beverage. An apple juice is a nutritive fruit juice obtained commonly by pressing and crushing of apples. It is obtained by the maceration process, in which the apples are cut, softened and broken into small pieces with the help of liquids. The resulting expelled juice is then treated by enzymatic and centrifugal clarification, to remove the starch and pectin, as it holds the fine particulate in suspension. The juice is further treated by dehydration processes to concentrate. The vitamin C content is also added in the juices for fortification and prevention of oxidation. Vitamin C gets removed while processing. Apple juices are commercially produced in the world by China, Poland, the United States, and Germany. Apple juices are rich in various minerals and nutrients, including boron, which promotes healthy bones. They have a significant concentration of natural phenols (of low molecular weights) along with chlorogenic acid, flavan-3-ols, and flavonols and procyanidins, which protects from diseases related to aging. 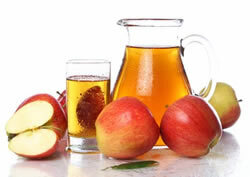 Apple juice has an antioxidant effect, which help in reducing developing cancer and Alzheimer's disease. A research suggests that apple juice increases acetylcholine in the brain, which improves memory. They have higher concentrations of sugar. Unlike most fruit juices, apple juices also contains a similar amount of sugar, but lacks in fiber contents. Apple ciders are also called as sweet cider or soft cider. It is an unfiltered, unsweetened, non-alcoholic beverage. They are sometimes opaque due to fine particles of apple suspensed in the liquid; and sometimes tangier than conventional filtered apple juice, which depends on the apples used. for use throughout year. They are prepared by washing, cutting, and grounding of apples into a mash, which has the consistency of applesauce. Layers of this mash are then wrapped in a cloth and placed upon the wooden or plastic racks. A hydraulic press then squeezes these layers together, and the juice is allowed to flow into the refrigerated tanks. The juice is bottled and sold as apple cider afterwards. The unpasteurized form of apple cider is typically made from blends of several different apples to give a balanced taste. 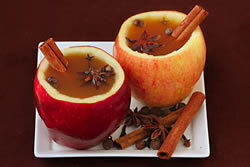 There are variations of apple ciders such as: Hot apple cider or mulled cider, Sparkling cider and Cider doughnuts. These are classified according to the type of seasons. It is a fruit juice. It is a nonalcoholic beverage. It is a transparent liquid. It is an opaque/tangier liquid. Here the particulates are not suspended, the liquid is transparent. Here the particulates are suspended, the liquid is thick. It is not seasonal, available in all seasons. It is filtered and pasteurized form of liquid. They are unfiltered and unpasteurized form of beverages, obtained from apple juices. It is preferred by everyone at any time. It is the official state beverage of New Hampshire. It is used for curing of some diseases. It has no such applications.